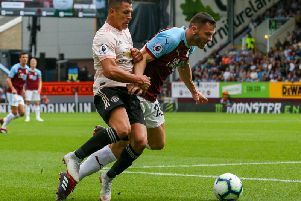 Former Burnley midfielder Richard Chaplow has been banned for two games by the United Soccer League after using “offensive and abusive language”. The punishment comes after United States international Robbie Rogers, who is gay, posted an account on his Facebook page about receiving homophobic abuse while playing for LA Galaxy II against Chaplow’s Orange County Blues. And Chaplow, whose former clubs include West Brom, Preston and Southampton, was sanctioned on Wednesday. A USL statement read: “The United Soccer League has suspended Orange County Blues FC midfielder Richard Chaplow for two games and fined him an undisclosed amount for offensive and abusive language directed at another player during his team’s game against the LA Galaxy II on Aug. 20. “The suspension was determined following the USL Disciplinary Committee’s investigation into the matter that included a video review, speaking with the referee, as well as players and staff from both teams.